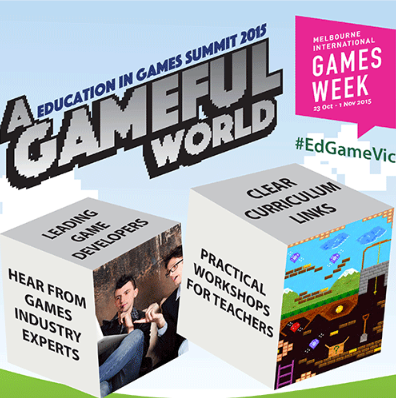 As part of International Games Week in the last week of October, Victorian primary and secondary teachers will have the opportunity to listen to some of the leading players in the game development industry. With its growing popularity among young people and the world, the Education in Games Summit 2015 is an ideal opportunity for students to leap into this growing industry. Presented by Creative Victoria, the Department of Education and Training and ACMI, the summit is a collection of workshops, speeches and panel discussions with industry experts. Curriculum connections and information to the new Digital Technologies curriculum will support teachers to learning about implementing the curriculum in the classroom. Attendees can customise their experience and find events that interest them over the all-day event. The keynote speaker for the summit is Dr Steffen Walz, an Associate Professor at RMIT University and the founder-director of Games & Experimental Entertainment Laboratory, the GEElab. At the GEElab, an international team of researchers scrutinizes the potential (and pitfalls) of play, games and game design elements for non-entertainment purposes.